Another weather inspired polish choice for today. The temerature went up a bit the last few days which makes for sogy, foggy and wet cold days. It can get kinda gloomy. Not to say Cult Nails Princess is gloomy, but it has a murky, dusty look to it that is both representative of the weather and kind of brightens you day! 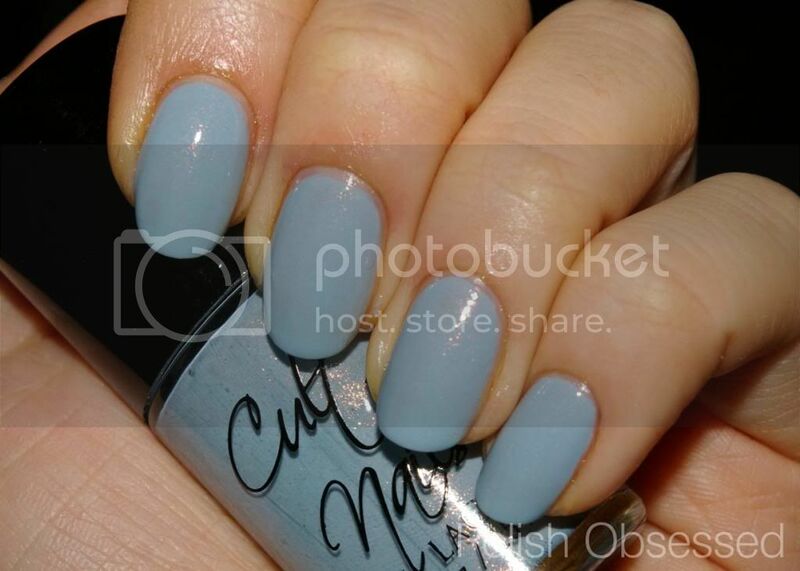 Princess is a soft putty grey blue with a sprinkling of pink and gold shimmer. The shimmer is not as noticable on the nail as it is in the bottle, but I wouldn't change that. I like the subtleness of it, It adds a bit of depth. I only required two thin coats for full opacity and it dried realy quick, I am so impressed with this polish! I have a bunch of Culties that I haven't worn yet, I think I need to pull them out ASAP because I couldn't ask for more in terms of formula for a polish. The wear is also awesome. I decided to go with my second favorite top coat to layer over Princess, NYC In A New York Minute quick dry top coat. It is way thinner than Seche Vite but adds an amazing gloss and aids in quickly drying the polish. I have to start using it more often. Princess and the NYC top coat worked in perfect harmony together, it kept the polish well protected with a glossy finish. Lovely shade! I have to see if I own this one; I can't remember! Indeed this looks like a perfect color for this time of year.